Photography for Sonja Rieger is about the examination of place through the study of its inhabitants, the empires they build and the monuments of daily life that they celebrate and endure. It is also very much about the poetry of image, the collage that color, movement and form build and about events and people that shift the trajectory of history. 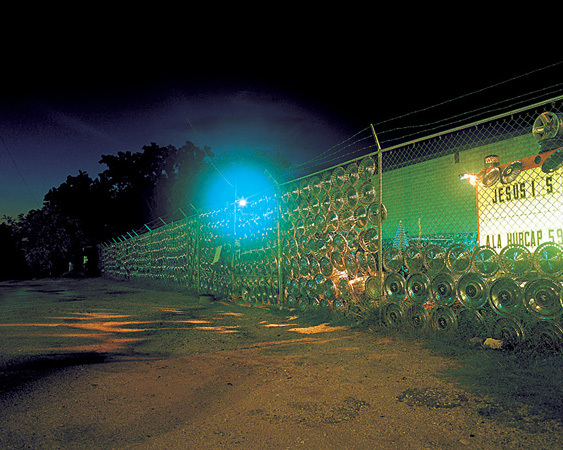 Sonja Rieger’s new photographs were taken in the town of Camden, Alabama, some thirty eight miles from Selma, Alabama. As of the 2010 census, there were 2,020 people residing in the town; over one out of four households had a female householder with no husband present. Rieger’s new series of photographs are portraits of young girls in their Halloween costumes, some of the costumes were purchased, some were homemade, as if cobbled together in a marvelous attempt to escape a reality, an everyday routine, a town too small, a place too hard. The girls‘ faces marvel at the camera, as if it would, could, transport them into their newly adopted identity; the superhero, the princess, the queen. In an attempt to document a moment of escape, of wishful “otherness”, we, the spectators, gaze at faces filled with excitement, happiness, shyness, and sometimes disillusion; but also stares of resolve, defiance, and determination. Photographic portraits as social commentary have existed all through the medium’s life, and Rieger’s most recent series makes us immediately think of the photographs shot in South Alabama by Arthur Rothstein (1915-1986), while working for the U.S. government. Rothstein’s series of images shot in 1937 in Alabama - especially the image “Artelia Bendolph, Gee’s Bend, Alabama, 1937 ” (shown on left). 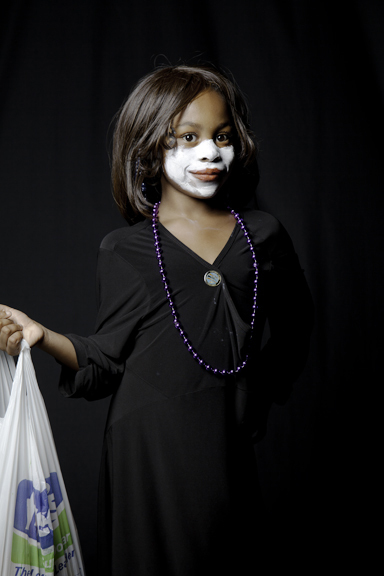 The photograph conveys a strong visual statement on the girl’s living condition, and an immediate parallel is drawn to the living condition of her fellow black Alabamians. The serious, weighted expression on the child’s face poignantly illustrates her disenfranchised social and economic position. The framing of the crude cabin window and the newspaper insulation with its unattainable food advertisements reinforce her isolation from the recovering American economy. 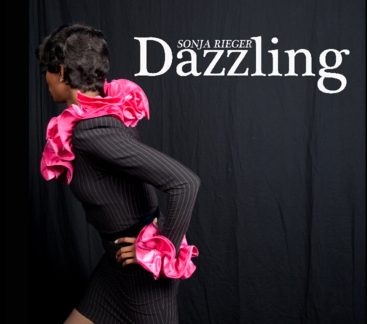 Sonja Rieger (b. 1953 in Ansbach, Germany) earned her MFA in 1979 at the Rutgers University Mason Gross School in Brunswick, NJ, and her MA in 1976 at the University of Massachusetts in Amherst, MA. Her work can be found in the permanent collections of the 21c Museum in Louisville, KY; the Ogden Museum of Southern Art in New Orleans, LA; the International Polaroid Collection in Cambridge, MA; the Birmingham Museum of Art in Birmingham, AL; and private collections in the U.S. and Belgium. 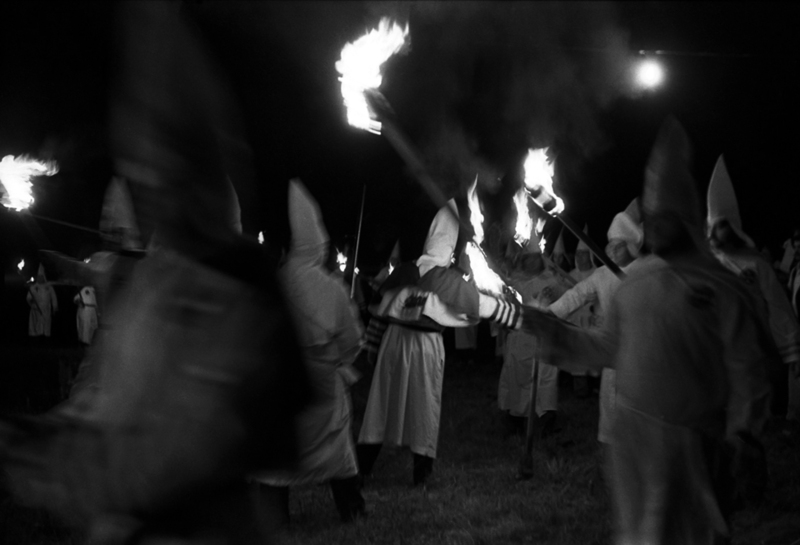 In 1979, photographer Sonja Rieger had just moved from New Jersey to begin teaching at UAB when she got the opportunity to take some shots at a Klan rally in Gardendale, Alabama. 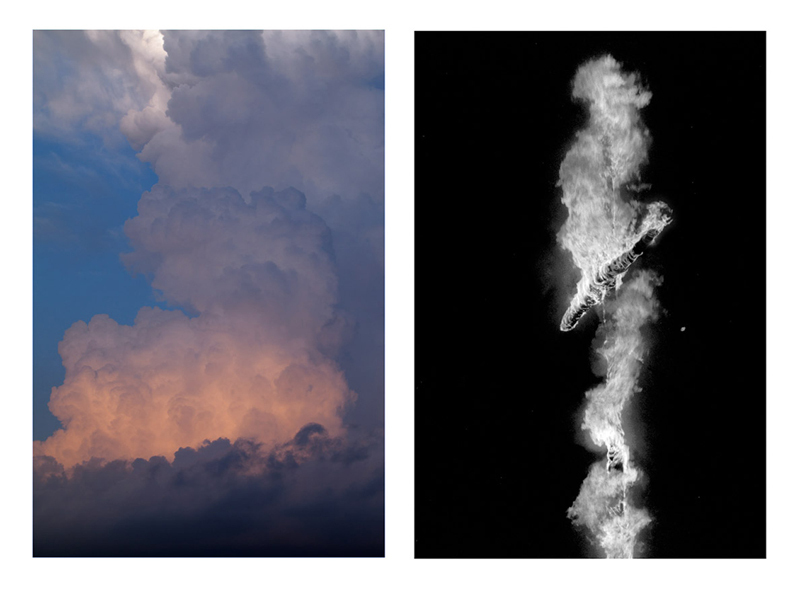 Those photos are being exhibited for the first time, and although the images of burning crosses and Klansmen are powerful documents in their own right, Rieger has chosen to juxtapose huge scans of the shots with equally large digital images she has taken of clouds and sky. This remarkable juxtaposition greatly enhances and elaborates the undeniable cinematic quality of the photographs. It’s as though she has located, after decades, the proper scale on which her Klan images most effectively engage the viewer. Rieger’s images of cloud formations (she connects October skies with the time of year the Klan rally took place) are at once bold and pastoral, bringing to mind the big skies of 19th century landscape painting and the contemplative cinema of Terrence Malick or Michelangelo Antonioni. There may be a hint of gathering storms in those cloud formations, which find analogies in close-up shots of smoke billowing from a burning cross. 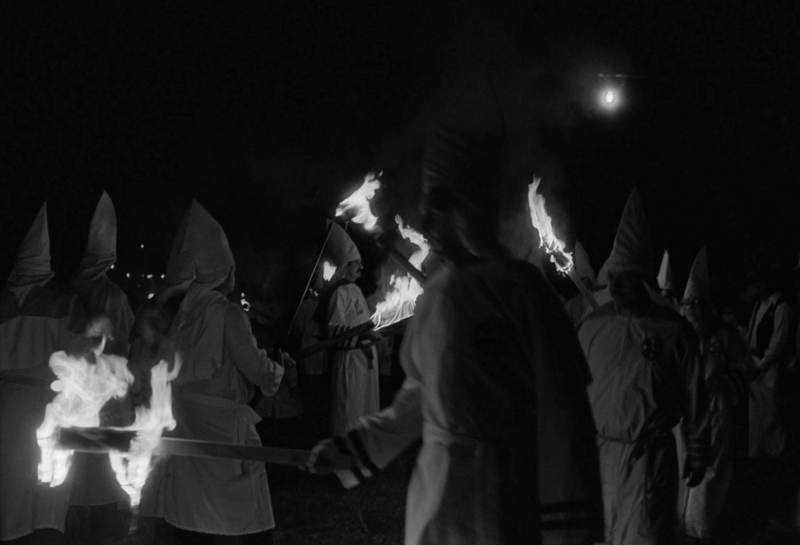 The exhibition’s central image of Klansmen and spectators gathered around the Imperial Wizard lends the immediacy of news footage from the Civil Rights era, or the stark realism of documentary works by D. A. Pennebaker and the Maysles brothers. The combined imagery of cloud formations and Klan rally, presented on such a scale and with the movement/drama of motion pictures, recalls Storm Warning (1951), Hollywood’s first critical (if timid) depiction of the Klan in the South, starring a politician who would reach the White House two years after these photos were taken. In that context, perhaps Rieger’s stunning images leave us to wonder precisely who is being warned here. Although one Klansman in the central photo offers a menacing glance directly at the camera, he doesn’t know he’s just a few years away from the Southern Poverty Law Center’s landmark lawsuit that bankrupted the Klan; less than five years from Jesse Jackson’s galvanizing address to the Democratic National Convention; six years from Michael Jackson taking over pop music; and only a generation away from America’s first Black president. Nonetheless, although the subjects of these photos are, culturally speaking, galaxies away from us now, Rieger momentarily convinces us that the distance is actually about ten feet across the room.